PROWELD | Toronto Electric Fireplaces | Modern Glass | Buy Now Sale! Types of Electric Fireplaces: Let your Imagination Run Wild! Buying an electric fireplace doesn’t require you to have a mantle available in your home, and doesn’t mean you need to buy a fireplace with a mantle around it. For those living in apartment buildings or small townhomes, an electric fireplace can be a much wanted source of warmth for the home, and can add a homey feel to any area, no mantle needed. A Sierra Flame & Amantii electric fireplaces Toronto modern fireplace insert can be purchased and fashioned in a wall without any need for a mantle, and will still look fantastic! While a wall mounted electric fireplace is a great way to save space, it is not necessary. In fact, a modern electric fireplace insert can be placed in virtually any spot. Cabinets are available to be outfitted with electric fireplace inserts and can substitute a wall mount or mantle mount. Such cabinets can be purchased directly to house an electric fireplace or they can be converted by ordering a custom fitting insert. An insert like this can be purchased in a variety of sizes and colours, and can be tailored and outfitted to match any space. There is no need to compromise. Inserts are sold with clear glass through which light shines and can be bought with glass faces, so as to make your already beautiful fireplace shine even more. Our favorite ideas are a double sided glass insert which can be viewed from both sides of a shelf dividing a room or living area, or a curved glass insert which will bounce light to all corners of the room. Similarly, your old TV stand can be outfitted with a bright warm fireplace too. Imagine watching the game in front of a warm fire! It can be done, and quite easily. Many shops and websites offer cabinets, TV stands and media consoles designed to be outfitted with an electric fireplace. Save yourself the hassle of building a mantle and a vent for wood or gas burning fireplaces, and instead purchase on which can be easily incorporated into your furniture. Another option for those who like their current TV stands or simply don’t want a fireplace there is a free-standing electric stove fireplace. Available in thousands of styles, these cute little portable heaters match any interior and can be moved and placed anywhere desired. This no-hassle, stylish version of a space heater is a great idea for homes that need some extra heating and light. Overall, it is apparent that electric fireplaces offer the most flexibility in terms of placement and style. While picking the right kind of fireplace can be a hard decision, with electric fireplaces there is a multitude of options that you can consider. If necessary, simply trying out a small, portable electric space heater is a good idea to test if an electric fireplace is the right addition to your home. For those of us looking to incorporate some warmth into their home without having to deal with the smell of wood or gas, or making a massive hole in the wall, electric fireplace inserts or furniture made be used with a fireplace are a fun, easy solution. Electric Homes offers the best Modern Electric Fireplaces Inserts in the region and our fireplaces are currently featured in homes across the GTA, including Toronto, North York, Vaughan, Richmond Hill, Thornhill, Markham, Aurora, Newmarket, Brampton, Mississauga, Oakville, Burlington, and Hamilton. 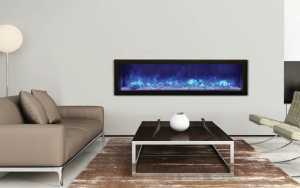 If you’re looking to purchase the best and luxurious Modern Electric Fireplace inserts for your home, contact us now!